I just didn't want to go without posting, so I thought that over the next few weeks, I'd bring you some "old" artwork. Maybe you've seen it, some I've never posted, but this is a good way to keep in touch! This is the beautiful Unforgettable paper from CTMH. I created a window and used layered botancials to hang in the window. The clear buttons across the bottom all have botancials underneath them. 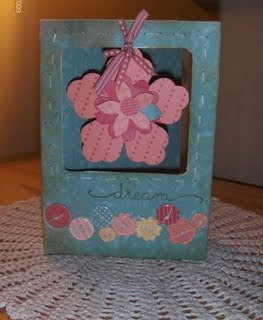 Fun card to make! Love to see all your projects-thanks so much for sharing. I love this beautiful card! The soft colors are just right for the window and the clear buttons. I do hold you in my prayers and know that God's healing hand is wrapped around you!